You’d be forgiven for thinking RSS died off with the passing of Google Reader, but our old friend Really Simple Syndication (or Rich Site Summary) still has a role to play on the web of 2017. It’s faster, more efficient, and you won’t have to worry as much about accidentally leaking your news reading habit to all your Facebook friends. Whether you’ve never heard of it before or you’ve abandoned it for pastures new, here’s why you should be using RSS for your news instead of social media. For the completely uninitiated, RSS is just a standardized way of presenting text and images in a feed that can be used by a variety of apps and web services. It is just like how Twitter has a standard way of presenting text and images that all the various Twitter clients understand. Sites follow the rules for publishing their articles via RSS, and RSS readers follow the rules for presenting the information and laying it out. 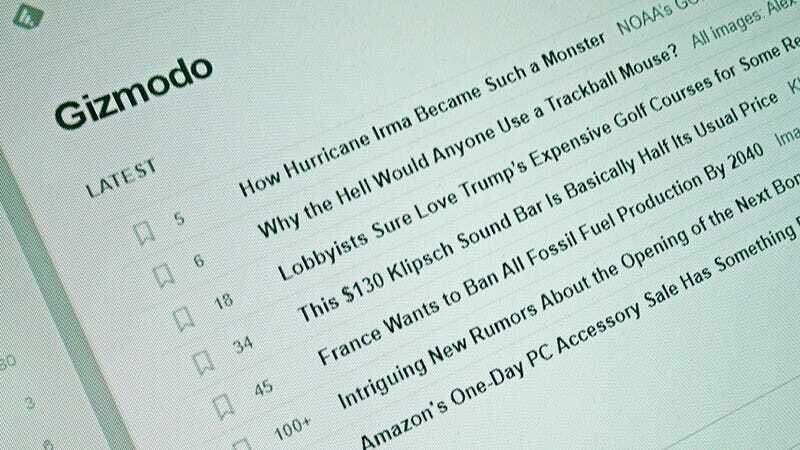 RSS requires some effort from publishers to cobble together an active RSS feed for their site, but the smartest RSS readers out there can often piece together a feed from new articles on a site even if there isn’t a dedicated RSS channel. Reader apps, like Feedly or Reeder, present new articles in a summarized, chronological list, usually in shortened versions that can then be expanded on the main source site. In our age of information overload that might seem like a bad idea, but RSS also cuts out everything you don’t want to hear about. You’re in full control of what’s in your feed and what isn’t, so you don’t get friends and colleagues throwing links into your feeds that you’ve got no interest in reading. Perhaps most importantly, you don’t need to be constantly online and constantly refreshing your feeds to make sure you don’t miss anything. It’s like putting a recording schedule in place for the shows you know you definitely want to catch rather than flicking through the channels hoping you land on something interesting. There’s no rush with RSS—you don’t miss out on a day’s worth of news, or TV recaps, or game reviews if you’re offline for 24 hours. It’s all waiting for you when you get back. And if you’re on holiday and the unread article count starts to get scarily high, just hit the mark all as read button and you’re back to a clean slate. It’s certainly still possible to create a little news bubble for yourself with your choice of RSS feeds, but assuming you are enlightened enough to pick a few divergent sources, those articles come through without any kind of extra commentary or spin. You don’t have to read what your uncle thinks about the latest action taken by the President, or go down a rabbit hole of nested Facebook comments to get to the actual news at the bottom of it. Sure, your chosen news sources might be opinionated, but at least you’re cutting out some of the white noise on top. As we’ve already alluded to, when you follow the news via social media, you’re relying on other people bringing you the news, unless you’re following individual news stories. RSS is like getting your newspaper of choice delivered to the front door rather than relying on heading down to the local bar to listen in on what everyone’s shouting about. With only one page to visit rather than dozens to catch up on, you can spend less time aimlessly drifting around and more time catching up on the posts that matter. News is the primary driver behind RSS and most of your feeds are going to be populated with dozens of new articles a day, but the technology also proves its worth for keeping track of other stuff you’d typically miss on social media. Maybe that might be new wallpapers on your favorite art site, or an obscure blog you don’t want to miss a post from. You can find RSS feeds for weather updates, new versions of apps, keyword alerts on search engines, new videos on your favorite YouTube channels, and even recent changes to the Netflix catalog. Basically anything you might want to keep track of and not miss because of the cacophony of voices on social media, RSS can help out with. The always-useful IFTTT (If This Then That) is fluent in RSS, giving you even more ways to make use of RSS. You can build applets to generate tweets or Facebook posts or Instagram updates from a particular feed. Zapier is another service that can take RSS feeds from anywhere in the web and plug them into other apps and platforms. Take a tour around the web and you’re going to find RSS in more places than you expected, whether that’s subreddits or users on Reddit, categories on Craigslist, or podcasts on SoundCloud, and your RSS reader of choice will be able to handle it all. Speaking of RSS readers, we can’t give you a full rundown of all the different apps out there, but we can recommend a handful. Digg Reader sticks to the basics but does them well, letting you bookmark articles for later reading and surfacing popular content from the rest of the Digg network (if you’re interested in seeing it). Feedly is a more comprehensive option, especially if you opt for the paid-for Pro version, with mobile apps and topic boards, and an appealing-looking layout that you can customize in various ways depending on how quickly you want to power through your feeds. Feedly also boasts plenty of third-party integrations, including IFTTT. Meanwhile Panda is a clean and relatively young news aggregator, that works on the web and comes with a host of different layout options to choose between. It’s not quite as powerful as some of the other options out there, but Panda is promising plenty of plug-ins and new features on the way in the not-too-distant future. Since Google Reader’s demise, the RSS reader scene has been quite a chaotic one, so before you invest in a client app to call your own, make sure you can export your feeds at a later date if you want to be able to take them elsewhere.